At the dawn of the 20th century, the defenses of Puget Sound consisted of six Coast Artillery posts, two near the navel facilities of Bremerton, three clustered around Admiralty Inlet and one guarding Skagit Bay, the back door to Puget Sound. By 1910 these forts bristled with nearly 100 guns and mortars, making it the most heavily defended harbor north of San Francisco. Although the forts were never called upon to repulse a navel attack, they would be maintained for the next 30 years, changing little other than the addition of antiaircraft weapons and the removal of obsolete armament. Then, with the rising threat of attack in the early 1940s, the army embarked on a project to modernize the defenses of Puget Sound. This program included three new gun batteries, two new forts, and many improvements to preexisting installations. Also proposed was an additional fort at Cape Flattery. The military's plans for this site included four 16-inch guns, four 6-inch guns and a large Harbor Defense Command Post. These plans fell by the wayside however, as the war progressed and it became apparent that such an installation would probably never see action. Only three of the fort's twenty-two planned fire control stations were completed before the project was scraped. Of the two forts that were completed during the war, Camp Hayden was the most heavily armed, having two 16-inch guns, two 6-inch guns and several observation and command posts. 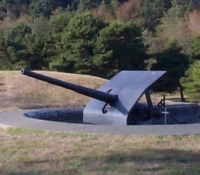 Located to the west of Port Angeles, Camp Hayden's batteries provided a wide field of fire, extending well into Vancouver Island across the strait. Fort Ebey, located on Whidbey Island, added two 6-inch guns and three observation posts to the World War II defenses of Puget Sound. After the war, many of these former defense sites found their way into the possession of the state or local government and are now operated as parks, preserving the remains of a fascinating period in coastal defense history.